It might seem very odd to call a group of Malawi cichlids “Haplochromis” when there are no Haplochromis species included in the group, but this has a historical explanation. When the Malawi cichlids became popular as aquarium species, a lot of the popular Malawi cichlid species were still considered Haplochromis cichlids. As more research was made, the scientists found out that these species did not belong to the Haplochromis group. Today, all the Malawi cichlids that were once counted as Haplochromis species have been moved to other genera. True members of the genus Haplochromine are not found in Lake Malawi, but in Lake Victoria. It is however still common to refer to certain types of Malawi cichlids as “Haps” or “Haplochromis cichlids” in everyday speech, and some pet stores still sell certain Malawi Cichlids under that name. This article is about those “fake” Haplochromis cichlids; Malawi cichlids that used to belong to the genus Haplochromine. Haplochromis species from Lake Malawi are commonly divided into three major groups: Utaka, Predatory “Haps” and Other “Haps”. The name Utaka is a word borrowed from one of the local languages spoken around Lake Malawi, and all Utaka species belong to the genus Copadichromis. In Lake Malawi the Utaka cichlids inhabit open water regions, but prefer to stay within a comparatively short distance from the cliffs. They form schools and feed on zooplankton. In order to more efficiently consume plankton, the mouths of the Utaka species have developed into a protruding shape. Utaka cichlids are popular as aquarium species, and the fish will form beautiful schools if you keep many female Utaka cichlids together. Utaka cichlids are also appreciated as food. Utaka cichlids are relatively peaceful and can be successfully kept in aquariums with Mbuna cichlids, as long as you choose some of the more docile Mbuna species and not the highly aggressive ones. Keeping different Utaka species together can result in crossbreeding, but you can decrease the risk by choosing species that look very different from each other. The aquarium where you keep your Utaka cichlids should ideally be high, and have a large area of open water for the Utaka cichlids to swim around in. Utaka cichlids will accept dry prepared foods, but they will do much better if you also feed them small crustaceans such as Cyclops. A varied diet with sufficient amounts of nutrients is necessary if you want the Utaka cichlids do display their full colouration. All Utaka species are mouthbreeders, but their breeding habits vary a lot. Some Utaka cichlids are seasonal spawners, while others are capable of producing offspring year round. Some Utaka cichlids build nests at the sandy bottom; some spawn out in the open water and a third group prefers cliffs as spawning sites. A batch will typically include 30-80 eggs. If the Utaka cichlids that you keep were wild caught it will probably take quite a lot of time before they feel comfortable enough to spawn in the aquarium. If they were seasonal spawners in Lake Malawi, they will probably stick to this breeding pattern even in captivity. If your Utaka cichlids were born in an aquarium, they will most likely spawn year round even if they belong to an annual species. A male Utaka cichlid with a seasonal breeding pattern will only defend a territory during the breeding period, and his striking breeding colouration will only show during this time. The second group consists of the Predatory “Haps”. A typical predatory “Haps” is large and prey on other Malawi cichlids. In Lake Malawi the Predatory “Haps” are not confined to any particular biotope; they visit many different environments in their search for food. Examples of Malawi cichlids belonging to this group are species from the genera Tyrannochromis, Naevochromis, Nimbochromis, Aristochromis, Dimidiochromis, Taenochromis, Champsochromis, Exochochromis, Hemitaeniochromis, Lichnochromis, Buccochromis and Stigmatochromis. All the Predatory Haps are mouth brooders, and spawning in captivity is not very common. A batch will typically include 50-250 eggs. The number of eggs depends on the species, but also on the size of the female cichlid. If you wish to keep Predatory Haplochromis cichlids from Lake Malawi you will need a large aquarium. Several female Predatory Haplochromis will do well together, while two or several males will fight each other constantly and should not be kept in the same aquarium. Predatory Haplochromis cichlids will often get along with Mbuna cichlids, as long as the aquarium has a lot of hiding places and natural borders that make it possible for the fish to stay out of each others sight. Smaller fish should never be kept with Predatory Haplochromis cichlids, since they will be eaten sooner or later. Your Predatory Haplochromis will appreciate live fish, but live fish can sometimes make the cichlid more aggressive. If you wish to refrain from live fish feeding you can choose clams or similar large crustaceans instead. Your Predatory Haplochromis will eat dry prepared food as well, but Predatory Haplochromis cichlids fed dry food can easily become obese. Females fed dry food rarely spawns in aquarium. More than one small serving of dry food a day is not recommended. The third group of Malawi Haps is a very diverse group, since it includes all the Malawi Haps that do not fit into the two other groups (Utaka and Predatory Haps). The group is simply called “Other Haps”, and includes such genera as Fossorochromis, Otopharynx, Cheilochromis, Tramitichromis, Chilotilapia, Protomelas, Cyrtocara, Taeniochromis, Mylochromis, Placidochromis, Hemitaeniochromis, Ctenopharynx, Hemitilapia and Sciaenochromis. The last genera, Sciaenochromis, is actually made up by predatory cichlids but is not counted into the Predatory Haps group since Sciaenochromis fish are much smaller, and also less aggressive than the other Predatory Haps. The “Other Haps” group includes herbivore fish, such as Hemitilapias, as well as insect eaters like the Placidochromis. Fish from this diverse group are generally speaking happy eaters in aquariums. They will accept prepared dry foods, but you should ideally supplement such a diet with food types more similar to the natural diet of the specific species. One serving of dry food each day that is supplemented with frozen food is usually recommendable. Be vigilant to avoid over feeding, since over feeding can make the males loose their colours. A large aquarium is necessary for most species. Use rocks to create hiding places. Avoid keeping more than one male in the aquarium, since males will fight a lot. Species from this group are all mouth brooders. Breeding the Sulphur-Crested Lithobate: Otopharynx lithobates - A detailed article about breeding this Lake Malawi mouthbrooder, together with some useful general tips. Home-made Rocks for the Mbuna Aquarium - A guide to help you mad home made rocks for your Mbuna aquarium. 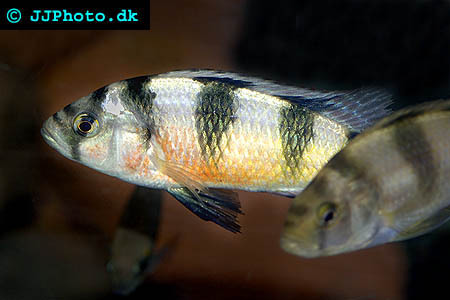 Pseudotropheus introduction - Basic information about Pseudotropheus cichlids from lake Malawi.